If you like a little crunch in your chocolate, then our pralines are for you! We make our own house praline from scratch with freshly home roasted nuts. As is the Demarquette standard, the chocolate used is made with only the finest cocoas from around the world. 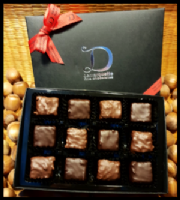 Our luxury chocolate pralines will not disappoint!